Free Resources for all TCC students. 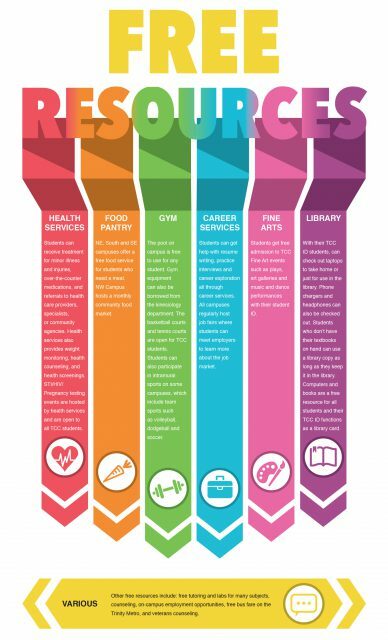 Being a TCC student has many benefits that many might expect, but there are also some resources students may not know are available to them. HEALTH SERVICES: Students can receive treatment for minor illness and injuries, over-the-counter medications, and referrals to health care providers, specialists, or community agencies. Health services also provides weight monitoring, health counseling, and health screenings. STI/HIV/Pregnancy testing events are hosted by health services and are open to all TCC students. FOOD PANTRY: NE, South and SE campuses offer a free food service for students who need a meal. NW Campus hosts a monthly community food market. GYM: The pool on campus is free to use for any student. Gym equipment can also be borrowed from the kinesiology department. The basketball courts and tennis courts are open for TCC students. CAREER SERVICES: Students can get help with resume writing, practice interviews and career exploration all through career services. All campuses regularly host job fairs where students can meet employers to learn more about the job market. FINE ARTS: Students get free admission to TCC Fine Art events such as plays, art galleries and music and dance performances with their student ID. LIBRARY: With their TCC ID students, can check out laptops to take home or just for use in the library. Phone chargers and headphones can also be checked out. Students who don’t have their textbooks on hand can use a library copy as long as they keep it in the library. Computers and books are a free resource for all students and their TCC ID functions as a library card. VARIOUS: Other free resources include: free tutoring and labs for many subjects, counseling, on-campus employment opportunities, free bus fare on the Trinity Metro, and veterans counseling.